I use my voice to speak about body positivity because nearly everyone has struggled with their body image at some point in their life. We grow up being bombarded with ads on how to lose weight in order to get the “perfect summer body”. We are told that the only way to be beautiful is to be skinny. So of course we accept that as truth and believe that the problem is with ourselves and not with society. The idea of dieting is so embedded in our culture that we often don’t realize how unhealthy our actions are. As a teenager I thought it was normal for me to restrict myself to 400 calories a day. When I would go to bed hungry I would applaud myself for doing such a good job at not eating. I convinced myself that what I was doing was okay. It hurts when I look back on how young I was when it started. I struggled on and off throughout my adolescence but I think the first time I went on a “diet” I was 11 years old. How sad is that? Having been there myself, it breaks my heart to see other young girls wasting their youth restricting calories and malnourishing themselves. As teenagers we look to the media and celebrities as our role models. I never had anyone to look up to that showed me it was okay to love my chubby body. So that is why I decided that I wanted to be that role model for others. Representation and seeing someone that looks like you is of enormous importance for everyone, but especially growing teenagers. Nearly everyone in Hollywood is thin, and when there is a heavier person in a movie/show, they play the weird friend that is deemed unattractive but funny. The main character/love interest is always blonde, skinny, and white. No wonder anyone who doesn’t fit that mold grows up questioning their worth! I am tired of seeing pathetic attempts at diversity consist of throwing in one black kid or one fat kid as a very minor character. When will we get a show/movie that has a minority as the main character AND doesn’t center the entire plot around the fact that they are ethnic/fat/queer etc? I want to see minority groups presented as normal people and not some strange creatures whose only qualities are the fact that they are a minority. As a plus sized Asian-American female, I have had to deal with people sharing their opinions when I certainly hadn’t asked for it. So I see the content I create as a way to share my stories and experiences. I see Instagram as a wonderful platform to connect with people and to show others that they are not alone. People will continue to voice their nasty comments no matter what, so it’s up to me to choose how I respond in order to show my audience that they are more than their stereotype. In order to further spread my message I have also recently started a clothing line @big_bad_co to empower people! Confidence is such a powerful feeling but it can be so hard to attain. I hope that through my words I can inspire others to be unashamed of who they are! Although we have made great strides, body positivity still has a long way to go. Specifically, we need to see more body positive role models who don’t have the “ideal” hourglass figure because that still isn’t totally inclusive. We need more big bellies and fat rolls and girls without triple D’s or big butts. I am not in any way shaming the girls who do have the hourglass figure but I am simply asking for more representation of girls without. Fat girls are sexualized based on the stereotype that they have large chests and big butts and those traits are what makes them “acceptable”. But not every fat girl has that. I also would love to see more men speaking out on body image issues because they are very real, but toxic masculinity makes men feel like their feelings are invalid so men often struggle in silence. Being biracial, I know that I am privileged in that I have light colored skin and more Eurocentric features, but Asian beauty standards still do affect me. Specifically, the stereotype of “cute petite Asian girl”. Being 5’11” and chubby, I felt a lot of pressure to try to make myself smaller. The idealized Asian woman is petite in size and fair-skinned. How do we remedy these toxic beauty ideals? I’ve said it before and I’ll say it again: representation is the most important thing that we can do. 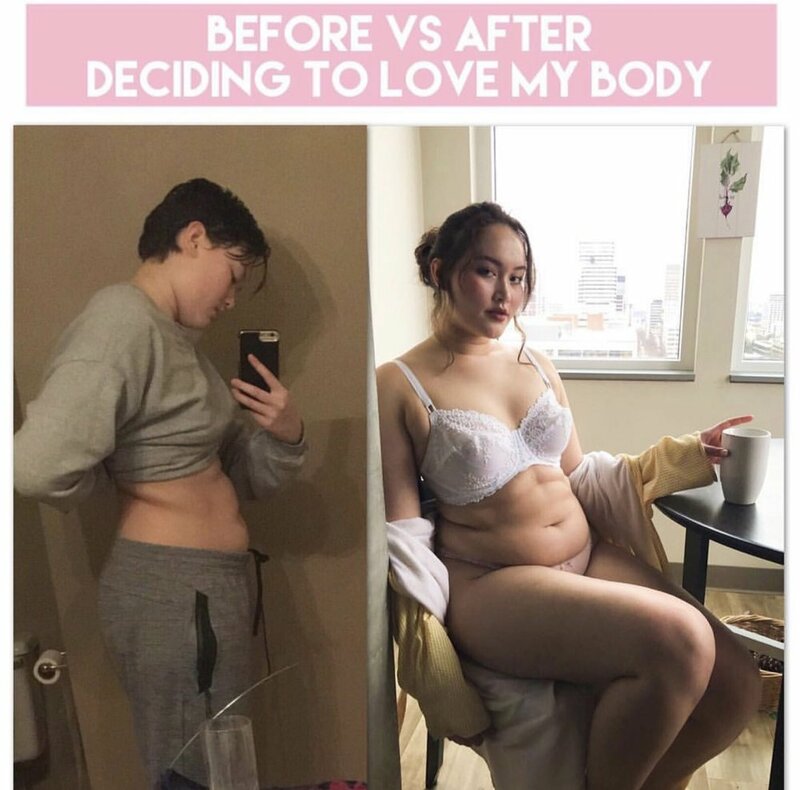 Follow Jamie Zella on Instagram and her website to learn more about her support of body positivity for all.